The term “buffing” is sometimes used to refer to polishing. 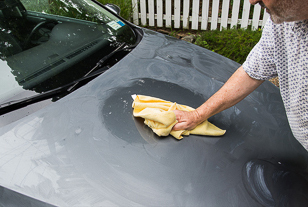 During buffing, you will remove any excess product and generally increase the level of gloss. It will also help in spread the product evenly, increase the chance of an even and level finish. When you’ve applied a wax or sealant, only a very small layer of this product will actually stick to the surface, the rest of the product will not adhere to anything. While hazing, the product will loose a part of its liquid content and result in a less translucent layer. The majority of the un-transparent finish is due to excess product. Buffing will remove this excess product, leaving a smooth and even finish with increased gloss. In the case of buffing polish, you are essentially removing excess product in order to remove old polish residue, paint residue and make it easier to see whether the surface is done, or if it needs more polishing. Buffing is done in several staging if the detailing process. Not everything should technically be called buffing, but sometimes it gets the name “buffing” because it is a similar type of motion. Buffing exposes you to certain risks. These risk can generally be minimized by using quality buffing cloths. Getting proper tools makes a big difference in the end result. An A-quality microfiber towel is recommended. When buffing a certain area, there is mechanical action involved. This movement can cause swirls and other imperfections if done improper. Apart from using a clean, quality microfiber towel, it is also advised to not use to much pressure. Turn the towel over frequently and make sure it is clean before you use it. Speed should not be a factor, although improper application of wax, sealant or coating can require the need to use more pressure. In some cases the use of a spritz of QD will help to make the job a lot easier. Buffing can also be done by machine. After the product has been applied to the surface, or you are finished with the process, the cloth on the machine can either remove the excess product or spread it out more evenly. Buffing by machine has also been used to finish the last step. It should add gloss and give the surface its final look. In this case the term “buffing” is used to describe the last part of the polishing process. The first one would be “sanding”, followed by “compounding”, then “polishing” with “buffing” as the last step.